Sortelha Castle is an authentic medieval fortress, which is now buried in ruins, but there is much to show its guests on the architecture of past centuries and an interesting story that is bound to the region. Sortelha Castle is located only 14 kilometers from the Portuguese settlement of Sabugal. The fortress stands cooled on top of a rocky hill and its fortress walls are surrounded by a stunning landscape at this elevation. Indeed, once upon a time the city was located entirely beyond the walls of Sortelha. The castle was erected there primarily for defensive purposes and from the final construction days it plays a crucial defensive role. Sortelha Castle was built in 1228 by King Sancho II. He chose the location very carefully, resulting that the Sortelha Castle started to be built at 760 m on a high plateau. Later the medieval defensive structure was strengthened and renovated by Kings Dinis and King Fernando. Sortelha Castle was an important defensive structure and was maintained because of its splendid location which allowed a perfect view of the entire region, which in itself is one step ahead of the action potential enemy. To this day, the medieval architecture of the Sortelha Castle is fully preserved in its authentic appearance. However, some people joke that at the the castle was erected to keep people, and today people must be protected from the ruins of the sunken castle. Strolling through the beautiful and narrow cobblestone streets of the fortress you will encounter a magnificent stone church. On the door a script was written from 1573, which is probably the date of its construction. The temple was built in the Renaissance style and is dedicated to Nossa Senhora das Neves. In most cases, the church was closed to visitors. The entrance to the fortress is small and there is a Gothic portal above which is the so-called balcony of Pilate, known as, Pilate's balcony. It has vents that were once for the burning oil and other protective materials during the battle. 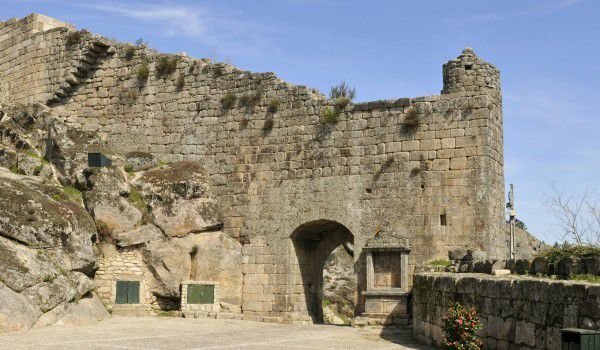 Be sure to stroll along the castle walls and to fully enjoy this excellent example of an early Portuguese castle, which is Sortelha Castle.